Many of us believe that yoga refers to some specific postures (often very complicated ones!). However, the concept of yoga involves much more than some exercises. This articles briefly describes the origin, philosophy, health benefits, and neurophysiological background of yoga. In separate articles, we have discussed specifically the exercise during pregnancy, the pregnancy yoga, the postnatal yoga, and the yoga postures to be avoided during pregnancy. Yoga is a philosophy, practice, and discipline to achieve a harmony and balance between the body, mind, and soul to achieve inner peace, health, and wellbeing. Yoga combines static postures, exercises, deep relaxation techniques, adaptation of a healthy lifestyle and a positive and optimistic mindset. Researchers believe that the yoga originated in India about 5000 years ago. This is not a religion and does not conflict with someone’s personal belief and religious practices. The word yoga comes from the Sanskrit word ‘Yug’, which means ‘union’. The science of yoga refers to the process of uniting the individual consciousness with that of the Universal Divine Consciousness. This path advocates doing everyday work as a selfless service without expecting any reward and thoughts of a success or failure. This path advocates uniting with the Supreme Being through prayer, worship, and rituals. Bhakti yoga is believed to fill the mind with divine love, peace, tranquility, and happiness through a systematic process of devotion and self-surrender. This is the path to enlighten the mind with the facts and realities of life. Jnana Yoga involves a systematic process to remove ignorance (‘Avidya’) from the mind to help the journey from the darkness to light. This is the most familiar form of yoga. This path of the yoga advocates a systematic process of controlling the mind. It is based on the eight-fold path set by the great ancient sage Maharishi Patanjali. 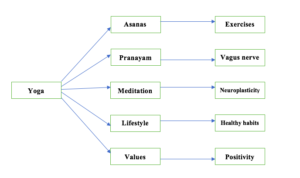 Researchers suggest that Patanjali described 8 aspects of yoga in the classic text, Yoga Sutra (300-200 BC). Therefore, this is also known as the Ashtanga yoga. – Brahmacharya: marital faithfulness and control of sexual desires. – Santosha: being content, accepting own circumstances, and accepting others as they are. There are many styles of yoga practices, such as Hatha Yoga, Vikram Yoga, Iyengar Yoga, Kundalini Yoga, Sahaja Yoga, and Ashtanga Vinyasa Yoga. Each style of yoga advocates different variations of the above basic yoga principles. What causes psychological pain and suffering according to the yoga? According to the yoga, the main cause of human sufferings is not knowing who we are and our unawareness of the true self (or Atma). Due to the ignorance of the true self, we create our own unreal identity with our body/ mind/ belongings and relations. This unreal identity or a false sense of the self is called Ego or ‘Ahamkara’. We want to acquire more wealth, power, and pleasure in the search for happiness and security. We then get psychologically attached and dependent on all the objects around us. This also leads to all our desires. Behind all the human desires there is a sense of incompleteness, imperfection, and non-fulfillment. We become happy when we get what we desire for. Then we want to get them more and more in the pursuit of greater joy and happiness. This, in turn, leads to the development of arrogance, greed, and envy. At the same time, we develop the fear of losing everything. On the other hand, when we fail to get what we desire for, we become angry, jealous, and unhappy. Therefore, whether our desires are fulfilled or not, the emotional turmoil still remains in our mind. As a result, we never get eternal peace, tranquility, and permanent happiness (bliss). The emotional suffering and pain, therefore, comes from within. Although we often blame the external world for our unhappiness and distress. This emotional turmoil/ disturbances could also lead to an imbalance in our body, mind, and spirit. This imbalance, in turn, could result in various diseases (both physical and mental). The advocates of the yoga believe that the inner peace and harmony can be achieved by recognising the true self. The yoga describes a systematic process to achieve this. The practice of the yoga helps us build our resilience. As a result, we do not get disturbed by the stresses of everyday life. 1. Reduce stress and preterm birth, and improves immune function. 2. Reduce intrauterine growth restriction (with or without preeclampsia) and improves birth weight. 3. Reduce the duration of the labour and less Caesarean birth. 4. Reduce depression during and after pregnancy. 6. Reduce pain/ discomfort during pregnancy, insomnia, and improve quality of life. However, the studies vary in different ways such as the yoga regime, methodology, duration/ frequency of practice. 1. Improving the psychological wellbeing: this includes increased positive thoughts and optimism. 2. Physical health: this involves better tone and strength of muscles, joint flexibility, and physical endurance. 3. Improved functions of different body systems, such as endocrine, neurological, immunological, and cardiovascular systems. How does the yoga work? It is not exactly known how the yoga helps in getting the health benefits. Pranayama (Deep breathing exercises) stretches the lungs and the diaphragm. This stimulates the vagus nerve. This, in turn, activates the parasympathetic nervous system. Neuroplasticity is a unique process of reorganisation of the nerve cell networks in the brain. Yoga Asanas are low impact exercises and helpful in improving muscle strength, tone, and flexibility. Yoga encourages to adopt a healthy and disciplined lifestyle. This includes a healthy diet, regular physical exercises, and avoiding addictions. 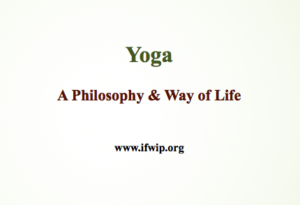 Yoga is a philosophy and a way of life. It also outlines the universal (Yama) and personal (Niyama) ethical principles and practices and moral values. This helps to develop a positive and optimistic outlook on life. What precautions are needed to be taken for pregnancy yoga? 1. Yoga during pregnancy should be done under the supervision of a trainer (who has experience and training in perinatal yoga). 2. Pregnant women are strongly advised to seek advice from healthcare professionals before commencing yoga/ exercise during pregnancy if they have preexisting/ or develop any medical condition during pregnancy. 4. Yoga should be considered as a complementary mind-body technique. This should not replace medical treatment of health conditions unless specifically advised by an experienced medical professional. 5. Hot Yoga (yoga practices under very hot environmental temperatures) should be avoided during pregnancy. 6. Certain yoga postures should be avoided during pregnancy.